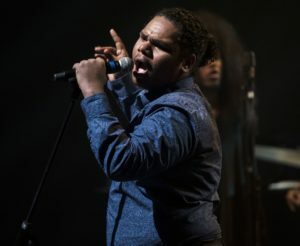 The Aboriginal Centre for the Performing Arts (ACPA) is rallying to see all 100 All Together Now judges stand up and sing with fellow student Royston Sagigi Baira in the hit show’s Grand Final this Sunday night. Royston, who is completing his Advanced Diploma in Performing Arts at Brisbane-based ACPA, wowed the judges of Channel 7’s reality series last month when he was the first singer in the $100,000 contest to get all 100 judges off their seats. ACPA CEO Dr Dimitri Kopanakis said the 19-year-old’s success with the show to date reflected not only his artistic talent, but also his resilience and determination to pursue a music career in the face of personal challenges. “Students like Royston who come to us from remote communities have to adjust to city life, the rigour of formal training, and doing all of this without their usual family support systems nearby,” Dr Kopanakis said. Royston acknowledged this in his piece to camera just prior to taking the stage in the semi-final. Dr Kopanakis said ACPA students’ course retention, completion and outcomes after graduation bucked national trends, significantly exceeding state and national averages for Indigenous students undertaking post-secondary training. “We don’t just teach technique. We also give students opportunities to develop their professionalism by performing alongside high profile entertainers at world-class venues,” he said. Anyone wanting to see Royston in a live performance can book tickets for ACPA’s end-of-year shows at QPAC on 7 and 8 December (details below).